View of road in Hampstead with distant view from the north of the City of London. Although originally a quiet farming community, Hampstead village was increasingly visited by Londoners after the discovery of a spring in 1698. 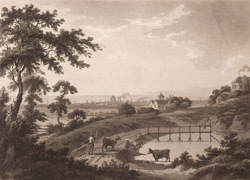 The village grew and prospered in the eighteenth century, Daniel Defoe noting in 1725 that it was ' growing from a little village almost to a city'. The artist is Thomas Stowers (1754 - c.1814).